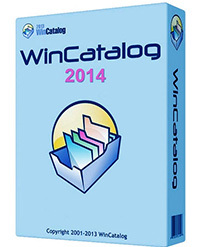 WinCatalog – is versatile cataloguer software for disks, files, folders and any non-file objects. It is not always easy to track where some files are located in your computer especially if you have a large collection of CDs and DVDs. If you are one of those users, then it definitely pays off to have the right tool for working with such a task. WinCatalog is software utility designed to help you find documents and data from your computer by building an index that offers you instant access to them. This program can be mastered even by less experienced users because it sports a straightforward interface. WinCatalog is a truly full-featured tool, so it would be natural to expect drag and drop support in such an app. Although the developer didn’t include this option, it made the process of adding files to the list pretty simple. You can add a fixed or removable disk, specific folders or individual files to the catalog. Virtual folders and customs items can be created pretty easily. The app works fast and it is able to display the contents of your folders properly by preserving the hierarchical folder structure. It remembers the files’ attributes (e.g. path, size, and dates of creation) and you can also preview them in the right panel. Ability to catalog any storage devices accessible from Windows environment. Ability to catalog individual folders on disks. Automatic extraction of archive file descriptions when scanning a disk. Automatic extraction of EXIF tags from digital photographs. Retrieval of Audio CD track names from Internet CD database. Support of non-file items: it is enabling you to catalog your books, videos or even postage stamps and coins! Individual comments for each item: disk, folder or file. Ability to manage your collection between virtual folders using Drag’n’Drop. Each item is associated with a set of keywords to increase the search relevancy. The catalog can be searched by file name, comment and keywords, date and size. Powerful search functionality: ability to use AND, NOT, OR operators and wildcards. Ability to search the entire catalog or an individual disk. When the disk data is updated, the previously entered comments and keywords are preserved. Ability to delete from the catalog the unnecessary files and folders. Ability to export and import parts of collection and the list of contacts. Ability to generate HTML reports for sending to someone, publishing on the Web or printing. Ability to export any folder to .CSV file (comma separated values) for opening catalog in MS Excel or other applications. Ability to automatically open the last catalog when the application is started. The most advanced improvements of the current version: thumbnails for video files and pending scans. WinCatalog can grab thumbnails for video files (codecs are required to be installed on the computer). Thumbnails also can be grabbed from some other types of files. In short, if Windows Explorer can display previews for your files, WinCatalog will also be able to grab the thumbnails. Using WinCatalog you can interrupt the scanning process, save intermediate results and continue at any time from that point. Now during the scan when you click Stop in the progress window, WinCatalog asks you if you wish to save or discard changes. This feature works for both scanning and updating processes.